I hope everyone out there had a great turkey day! I definitely stuffed myself, and now my first graders and I are back in action. I have a great subtraction game for you! The game calls for a deck of cards with the face cards removed. I found some SUPER cute gingerbread playing cards for $2.00 at Joann Fabrics. Click on the picture below for full instructions and the game board! Caps for Sale! A New Twist! This quarter in our first grade community we are learning about goods and services as well as counting money. I read aloud the book "Caps for Sale" by Esphyr Slobodkina, and as a class we discussed different elements, such as how much the caps were sold for, the difference between the country and the town, and finally if a cap was a good or a service. 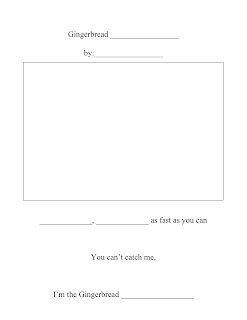 I then created a practice page for my first graders to practice with! On this page they have to decide how much to sell their cap for (under $1.00). Then the students cut out coins and show this amount of change two different ways! This sparked a really interesting discussion about what was expensive and cheap, and what they would sell their own caps for. It was a great social studies lesson, and if you click below you can download the practice page for yourself! So I have been waiting to post some things until it is more appropriate for the general first grade community! In our first grade community we are working on building a "Gingerbread Village". One of my wonderful, amazing friends gave me a copy of the unit their team uses in their classroom to create a community of gingerbread workers. It is really an amazing unit, but in order to finish before the break begins, we start in October! We begin by reading all different kinds of gingerbread stories. The last gingerbread story has a surprise ending where we are instructed to build a village for a community of gingerbread people! While we work on this unit, everything is related to our gingerbread village. 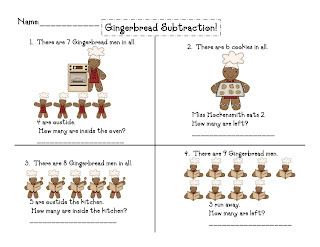 Therefore, I have created some fun gingerbread activities! These are fun to have around when it gets closer to the holidays, so use them whenever it's appropriate for you! 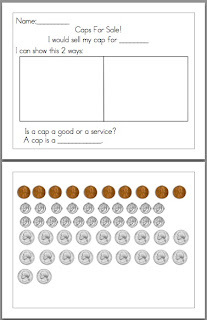 This activity is a subtraction word problem page. 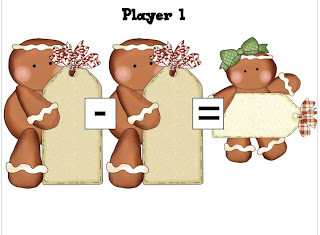 It uses the gingerbread men to create fun subtraction stories. The above activity was used as a Writer's Workshop mini-lesson. The previous day we read "The Gingerbread Man Loose in the School" by Laura Murray. This has some amazing verbs in it! The day of the lesson, we taught what a verb was, and then gave examples from this book of other things gingerbread men can do! The students then had to use a verb for their gingerbread character and draw a picture of their character doing this action! We brainstormed a HUGE list to choose from.